When mysterious spacecraft touch down across the globe, an elite team – led by expert linguist Louise Banks – is brought together to investigate. As mankin d teeters on the verge of global war, Banks and the team race against time for answers – and to find them, she will take a chance that could threaten her life, and quite possibly humanity. Science fiction is a genre that leaves room for ideological visions and fictional future scenarios. A technological fantasy story, as it were. In “Arrival” this is more applicable on a human level. In this case it’s the effort of humanity to communicate with an alien civilization. That’s fiction enough already. We’re not even capable of communicating with eachother as humans in a decent manner. Let alone with an alien race that speaks with the use of primal sounds. It’s like having a conversation with a group of surreal musicians who produce ingenious sound effects with polyphonic synthesizers. “Arrival” isn’t overloaded with graphical masterpieces what an average person would expect to see in a SF. No huge spaceships propelling through galaxies. There are no enormous space wars taking place with massive laser battles. No, just 12 black spacecraft, looking like huge black cashew nuts, floating seemingly motionless a few meters above the earth’s surface, spread all over our globe. The central theme is the almost impossible task to establish a communication between humans and aliens. This mission is being led by the linguist Louise Banks (Amy Adams) together with the mathematician Ian Donnelly (Jeremy Renner). For them it’s a real challenge to fathom the semantics used by these aliens and to interpret the sprayed circles (with extraterrestrial ink), produced by the tentacles of the octopus-like aliens. And next to that, her work is also hampered by recurring memories of her deceased daughter. A slow and über-serious SF ? You could conclude very quickly that this would constitute a slow and über-serious science fiction. A film to which literary scholars would respond rather enthusiastically. But believe me, “Arrival” is so ingeniously constructed and compelling that your attention won’t slack for a moment. Even if a Masai warrior would perform a “jumping dance” next to your couch. First there’s the melodramatic beginning with a brief, modest overview of Louise’s life and where fate hits merciless hard. Then we move on to the section where the visitors are introduced and Louise’s help is asked so she would give these, as immigrants considered newcomers, an integration course. The fact that only the US apparently are open to a dialogue while other countries, such as China and Russia, would rather shoot these coffee beans to smithereens, is in my opinion a romanticizing of our current global situation. The emphasis is on the educational aspect with Louise and Donnelly working against the clock and trying to start a dialogue. Meanwhile we see flashbacks about Louise’s daughter. A major event that runs like a thread through the film. However, when the disclosure becomes clear, the message behind the whole turns out to be much larger than the seemingly simplistic storyline. When the true reason for the alien visit is revealed and the implications get clearer, the film takes on a whole different meaning. “Arrival” is a SF with a philosophical slant that’ll give you food for thought. Ultimately communicating is the central message in itself. And this on all areas. Hats off to those aliens. They made this miserable long trip just to point this out to us humans. Way to go. 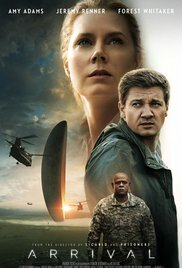 “Arrival” isn’t an action packed Sci-fi full of impressive CGI. But on the other hand, the shown images are incredibly beautiful. The concise fictional elements look minimalistic and at the same time amazing. Such as the entering of the spacecraft with it’s tilting, confusing gravity. The mood of this film is immersive. And this also thanks to the supporting soundtrack. Add to that the rather superb performances and a thoughtful script, and you’ll get a great movie. “Arrival” is not an exceptional SF, but still manages to impress thanks to a masterful concept. Villeneuve-worthy in other words. You’re so interesting! I do not suppose I have read through something like this before. So wonderful to discover somebody with a few genuine thoughts on this subject matter. Seriously.. thank you for starting this up. This website is one thing that is needed on the internet, someone with some originality!